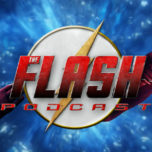 On this week’s The Flash Podcast, Andy, Amy and Lauren get together to review 2.21 of The Flash titled “The Runaway Dinosaur” which was directed by the one and only Kevin Smith as Barry Allen tries to get out of the Speed Force! In addition, they also finally announce the winner of the Flash Odyssey Art Torch give away! The gang also read listener feedback about “The Runaway Dinosaur” before getting to the preview session for next week’s episode titled “Invincible” which will feature Katie Cassidy as the Earth-2 version of Laurel Lance: the Black Siren! That and more on the latest episode of The Flash Podcast!